A list view is used to display multiple records from your database. Lists display multiple records from an object in your database using a flexible layout of rows. Any of the fields from that object can be used as details in the list. Each record in a list can be linked to a child scene to edit or view more details about that record. You'll also have options to display any connected records. 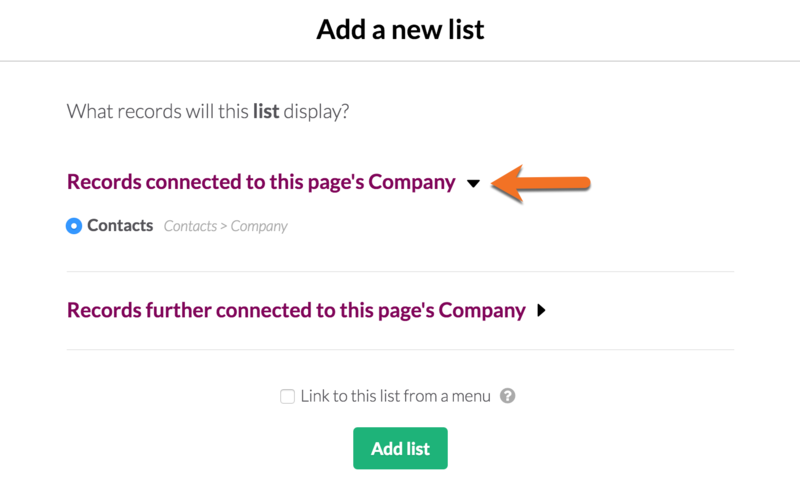 In the example above each company is connected to many contacts, so options are available to display those connected contacts or add a new one. 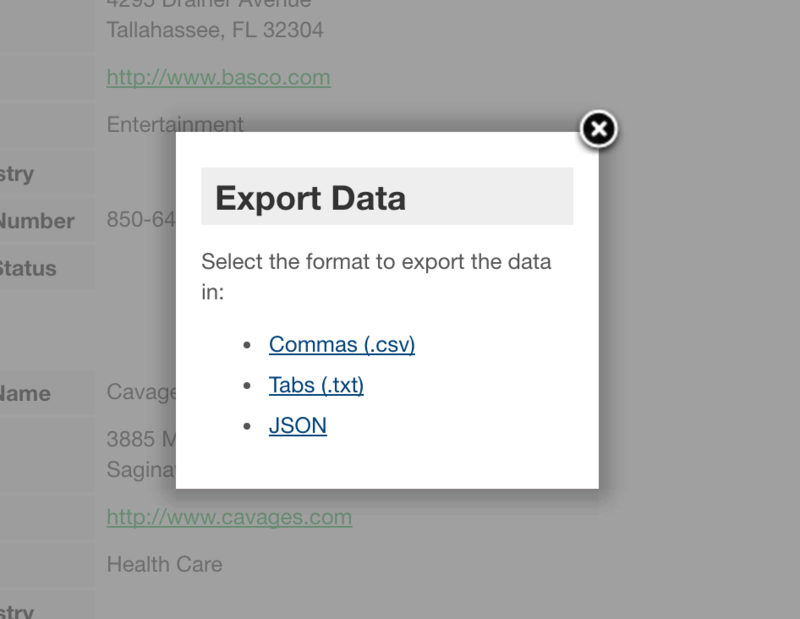 If your app is using connections, you can add lists to display connected records to any page displaying details about the parent record. 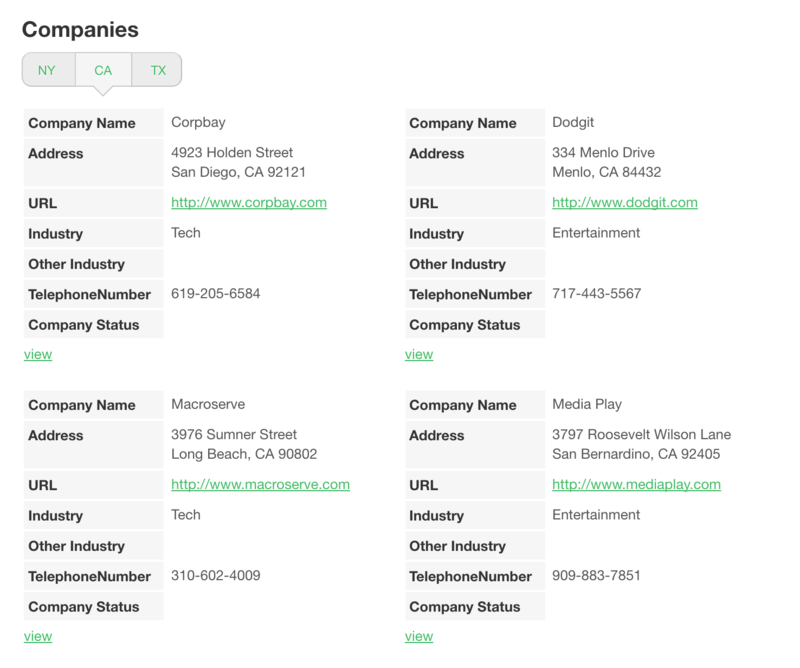 For example, in our Contact Directory example app, you can add a list on a Company details page to display Contacts connected to that Company. New lists will include the first six fields of the object by default. The list will open in "edit" mode where you can use the menu on the left to edit different aspects of the list. Data: the table will display all the object's records by default. Use the data section to add rules to limit which records will be displayed. Sort: control the default sort order of which records will be displayed first. The List Details section determines which fields the list will display for each record. This follows the same model as the Details view. The list layout allows you to display your list in 1, 2, or 3 columns. Pagination determines how many records will show at one time. If the total number of records exceeds the number set here, then links will be added to the list to navigate to additional pages, displaying more records. Let the user set how many records to view per page: This allows the user to change how many records they are viewing per page. Show pagination controls at the bottom of the list: this will display pagination controls at the bottom of the list as well as at the top. By default this will be the "page X of X" display. 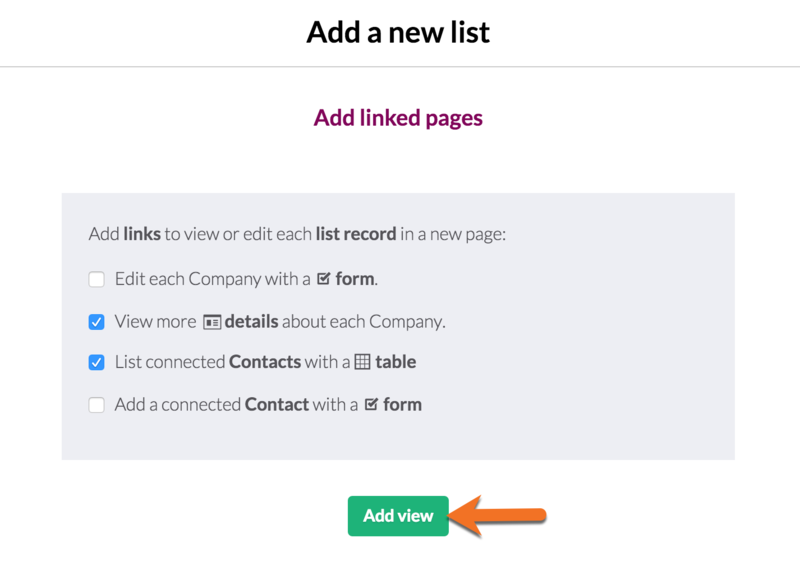 If the feature to allow users to set how many records to view per page is enabled (see previous bullet point) this option will also show at the bottom of the list. Displaying a keyword search will present a search field above the table for the user to enter keywords to filter which records will display. These keywords will search the entire record. On the search results display, a “reset” link will appear. Clicking this will reset all search criteria to easily search again with new criteria. Note: the keyword search will be combined with any rules added to the Data Source section. Note: the exported data will always reflect the exact data the list is displaying, including any sorting and filters. Filters give the user tools to further refine which records the table will show. You can add filters as options for the user to add, or as a menu. The list will update as soon as a filter is added. Multiple filters can be added as needed. You can determine if the fields available to filter are limited to the table columns or all the object fields. 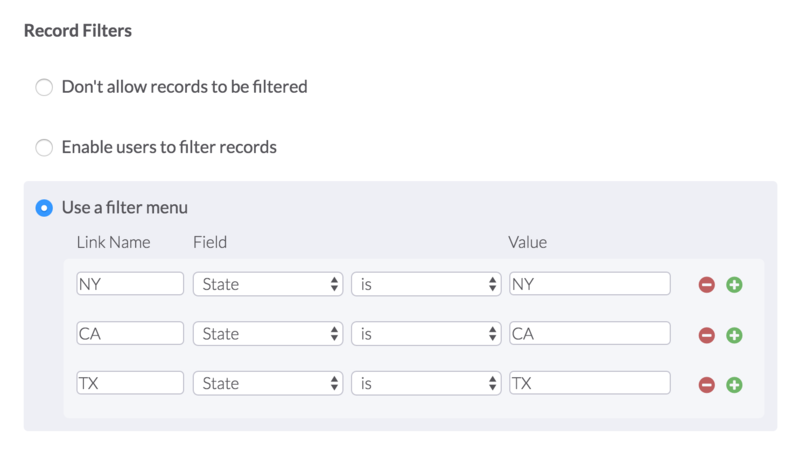 You can also add preset filters that will initially filter the records. Note: if you added rules to the list's Data Source (see above), those rules will be combined with any filters that are added.